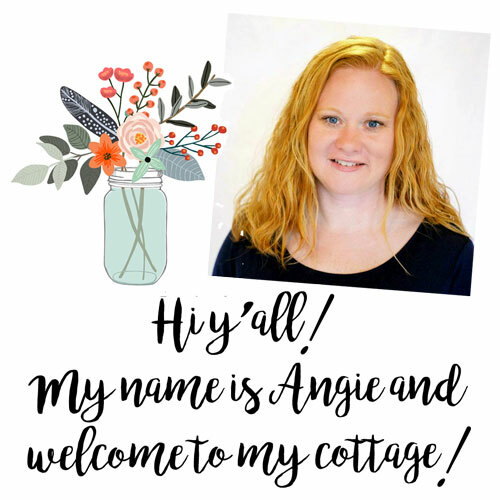 Continuing on with Wedding Week here at The Country Chic Cottage. Somehow my head turned to reception table numbers this week so I am going to give y’all some options for table numbers over the next few days. My goal is to keep all of my items themed for a rustic country wedding. After all this IS the COUNTRY chic cottage right? 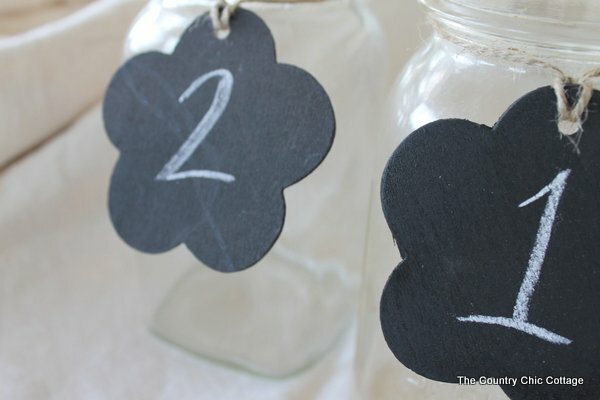 The first idea I had was to turn these wood chalkboard tags into reception table numbers. A simple wooden shape spray painted in chalkboard paint on both sides. 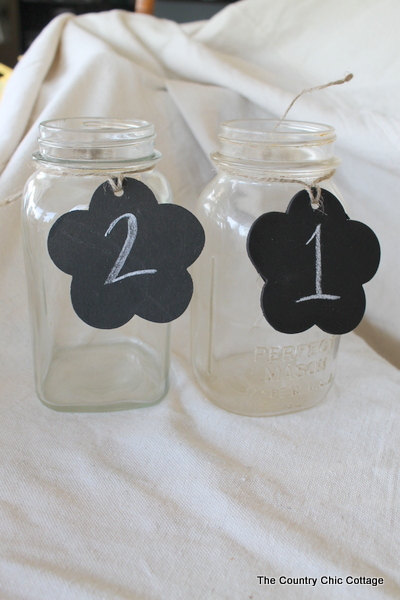 I attached these to mason jars to display them. 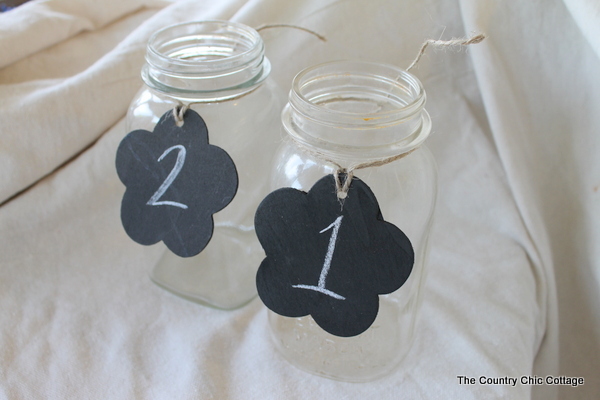 The mason jars could be filled with fresh flowers and used as the centerpieces. These are flower shaped wood cutouts and I added a hole in each to hang with jute twine. A very simple idea for your reception. Since I am having a wedding week and currently NOT planning a wedding. I am selling all of my creations this week in my etsy store. 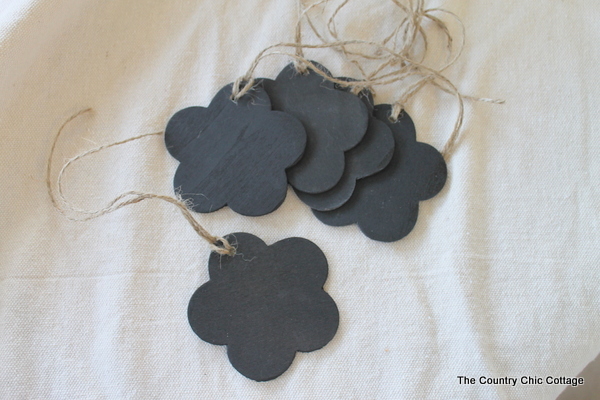 These flower chalkboard tags will be available until I run out for either your wedding or your home. These would also look great tied around a napkin with names written on them for place cards. Not having a wedding? I can see these in an office or child’s room for organization. Even gift tags for your next gift basket or bag. Visit my etsy shop for many more rustic country wedding ideas. Linking up to the wedding party on Dollar Store Crafts. 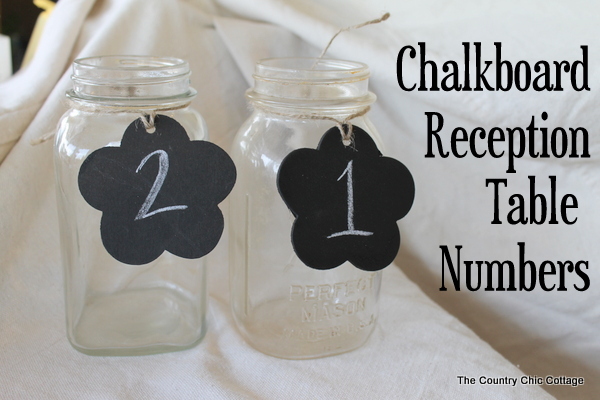 How much do you sell the flower chalk board for that goes around mason jars? Sorry Brittany I don’t sell them. You can get similar flower shapes here (affiliate): http://amzn.to/2ajDVX4 – then just spray them with chalkboard paint.